Dermajuv Neck Restoration Cream is a creamy, hydrating cream targeted at reducing saggy neck skin with five key ingredients. It’s made by Dermajuv, a leading brand that’s known for effective skincare, that promises ‘miracle cosmeceuticals for beautiful skin’. Dermajuv Neck Restoration Cream uses five ingredients to deliver neck skin that’s visibly more lifted and moisturized. Matrixyl works to combat deep-set wrinkles, one of the biggest problems in the neck area. Matrixyl, a copper peptide, not only works to reverse wrinkles it also regenerates natural collagen for younger, healthy looking skin. Sesaflash, the second of the five ingredients, gives skin an instant lift. It automatically tightens skin and smoothes out wrinkles on the surface. The stem cells found in Dermajuv Neck Restoration Cream help damaged skin in the affected area heal naturally and the Hyaluronic Acid and Shea Butter restores the skin’s natural moisturizing and firming elements. Dermajuv offers discounts and specials through their website and also guarantees the products with a 30-day money-back-guarantee. The website also provides personal testimonials of the product as well as before and after images to prove that Dermajuv Neck Restoration Cream will deliver the promised results. 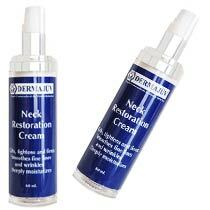 While many people believe that the only way to fix saggy neck skin is through surgery Dermajuv Neck Restoration Cream proves that there is an alternative to expensive and unsafe cosmetic procedures. The product guarantees youthful and restored neck skin, or your money back, and the testimonials and photos found on the Dermajuv website prove that many people believe that this product is the necessary miracle for your neck. The one problem with Dermajuv Neck Restoration Cream is that you cant use it on the decollete area and many other neck creams provide the added benefit of repairing skin damaged by the sun on the chest area so if you’re looking for a product that does both Dermajuv Neck Restoration Cream is not the right product for you.